of the distance between the bands, a quantit}r easily measurable. The conditions for producing interference of two pencils of light which had traversed paths at right angles to each other were realized in the following simple manner. reflected to the mirror d. The mirrors c and d were of plane glass, and silvered on the front surface. From these the light was reflected to b, where the one was reflected and the other refracted, the two coinciding along be. 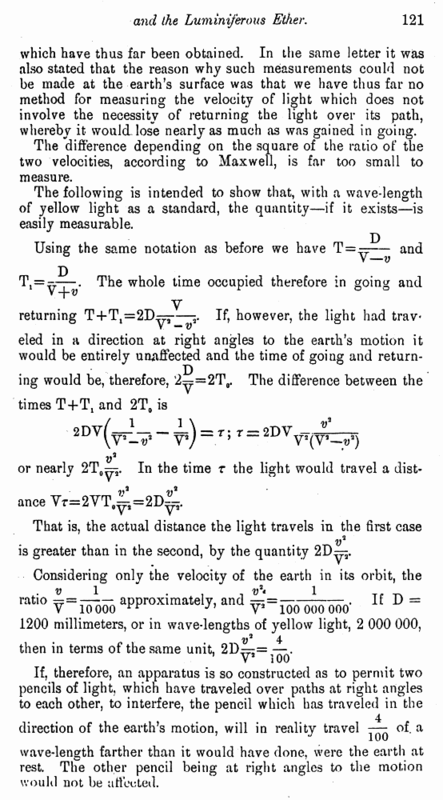 The distance be being made equal to bd, and a plate of glass g being interposed in the path of the ray be, to compensate for the thickness of the glass b, which is traversed by the ray bd, the two* rays will have traveled over equal paths and are in condition to interfere. The instrument is represented in plan by fig. 2, and in perspective by fig. 3. The same letters refer to the same parts in the two figures. 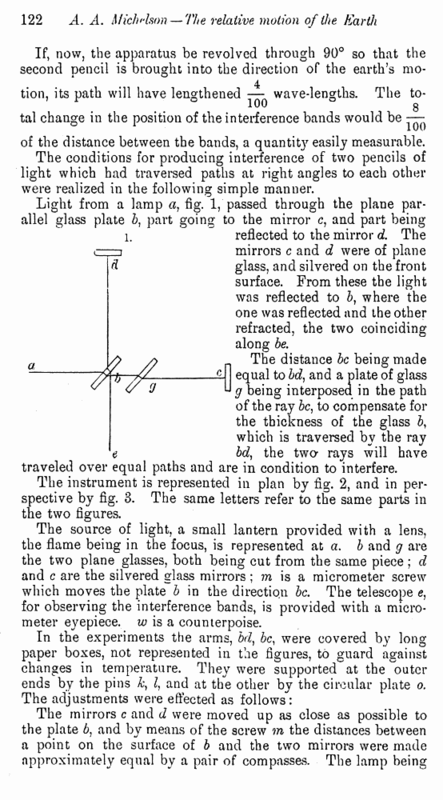 The source of light, a small lantern provided with a lens, the flame being in the focus, is represented at a. b and g are the two plane glasses, both being cut from the same piece ; d and c are the silvered glass mirrors ; m is a micrometer screw which moves the plate b in the direction be. The telescope e, for observing the interference bands, is provided with a micrometer eyepiece, w is a counterpoise.